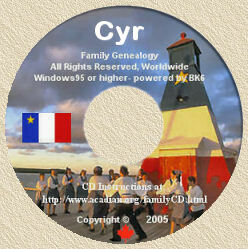 Acadian Genealogy Homepage; Acadian Aboiteau (Dyke). French colonists who left Poitou and settled in Port-Royal, Acadia, in the 17th century wasted no time in adapting ancestral techniques of controlling water in an effort to reclaim their land for farming. This marshland along the Baie Française is known today as the Bay of Fundy. The bay, surrounded by almost 31,000 hectares of marsh, has the strongest tides in the world, and over the years those tides have deposited a rich layer of alluvium that in some places is 40 metres deep. So the Acadians adapted a water control system to prevent the tillable portion of the marshes along the bay and along rivers from being flooded with salt water, an undertaking which earned them the nickname défricheurs deau, or water clearers. The system was comprised of two main elements: levees and tide gates, known as aboiteaux. These levees, massive embankments ranging in width from two to seven metres at the base and topped by a 60 centimetre-wide path or a roadway, were usually 45 centimetres higher than the high-water line. The slope, as much as 45° above the horizontal, was determined by the volume of water to be held back. Once a small, narrow, deep trench was dug in the middle of the spot where the levee was to be built (so as to anchor the levee in the mud and prevent it from sliding under the force of the tide), the face would be constructed. The walls were built of sod, and the space between the walls, like the body of the levee itself, was filled with clay. Each aboiteau or tide gate was comprised of a square or round sluice made of wood planks or a hollowed-out tree trunk up to 6 metres long and capped by a cribwork made of stakes and branches. Sloped slightly toward the sea or river, the sluice was installed in the bottom of a creek running through the levee and was fitted with a clapper or a valve that cleverly allowed rainwater to run off into the ocean at low tide but prevented salt water from infiltrating into the crops at high tide. If the land had little or no natural slope, a network of canals and trenches was built to carry the water to the creek leading to the sluice. 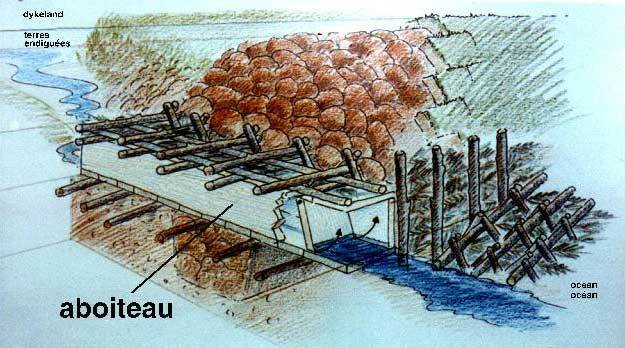 This system of levees and tide gates helped create a sense of belonging and pride among the Acadian people. Every owner of marshland was expected to help build and maintain the structures, either by working on them directly or contributing money or materials. The community nature of the endeavour was strengthened by the sheer magnitude of the common infrastructures: a levee could be up to 5 kilometres long. The levees protected vast tracts of land, and for that reason especially, people felt bound to preserve them for the benefit of all. Memramcook is the perfect place to commemorate the aboiteau system, because the Acadians still inhabit the area and it is where all the components of a tide gate, including the channel and the structure made of branches, are best preserved. The Memramcook Valley also features both river and ocean tide gates. The Acadians constructed earthen dykes to isolate areas of salt marsh from repeated inundation by the tides. Into the base of each dyke they built "aboiteaux" - wooden sluices fitted with swinging doors that allowed excess fresh water to drain from the newly claimed land, but shut to prevent re-entry of salt water at high tide. Drainage ditches channeled standing water away from the saturated soil, and after rainwater had diluted the salt content for a few years, the new fields were ready to sustain crops and livestock. Today, modern aboiteaux based on the same engineering principles are employed to maintain drainage of dyke lands. A rare original "aboiteau" is the jewel of the museum's artefacts. In 1990, local residents found a couple of boards sticking out of an eroding beach on Double Island, West Pubnico. They returned to the site in 1996 to remove the aboiteau, to preserve and display it at the musuem. Memramcook, New Brunswick, November 9, 2010 -- On behalf of the Honourable John Baird, Minister of the Environment and Minister responsible for Parks Canada, the Honourable Rose-May Poirier, Senator, today unveiled a Historic Sites and Monuments Board of Canada plaque commemorating the national historic significance of the Acadian aboiteau system. I am pleased to recognize the national historical significance of the aboiteau system, a technology adapted by the Acadian people that allowed the drainage of salt marshes for high-yield cultivation. This maritime technology played a pivotal role in the rise and evolution of the Acadian people during the 17th and 18th centuries, said Senator Poirier. The Acadian aboiteau system is the essential element of a technique to drain salt marshes. Throughout the colonial period, Acadians were the only people in North America to drain and cultivate a large portion of the rich salt marshes that lay below high tide mark. These exceptionally fertile farmlands were the key to the prosperity of the Acadian community up until the Deportation in 1755. Construction of these large-scale earthworks were community projects that contributed to the creation of a sense of belonging and pride amongst the Acadian people. The communal tasks necessary to build and maintain the large network of dikes have helped forge the Acadian identity of today. LaPlanche River AMHERST, Nova Scotia; Workers building a new sluicegate on the LaPlanche River got a bit of a surprise recently when their excavation uncovered a 250-year-old Acadian aboiteau. They didnt know what it was at first. It was a little extraordinary and didnt look like something theyd expect to find. It was buried under about three metres of marsh mud. They set it aside just in case it was something important and it was, Doug Bacon said. Its history that takes us back to the Acadian period. Bacon, who is participating in a Department of Agriculture project to divert the river through a new sluicegate, called in Parks Canada archeologist Charles Burke from the nearby Beaubassin dig to examine the five-metre long artifact and confirm that it was an aboiteau. An aboiteau is a hinged valve in a dyke allowing fresh water to run off a saltmarsh and prevents salt water from entering at high tide.